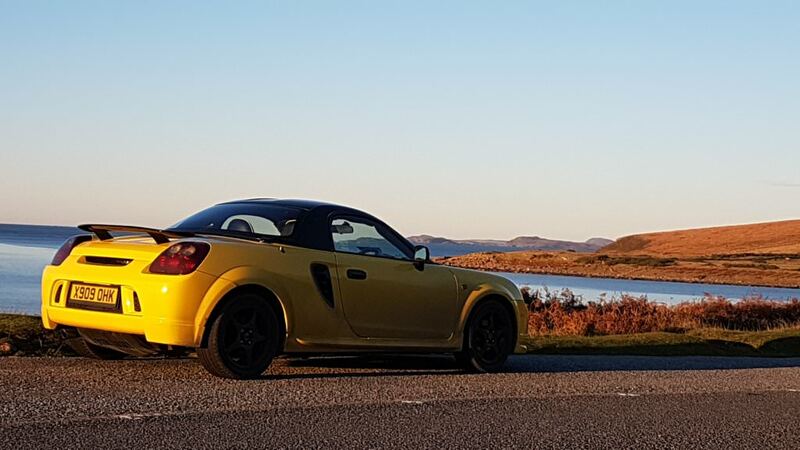 Not particularly unusual, seeing as how we live about 1.5 miles apart but, for what it's worth, that was me in not very stealthy stealth mode in the bright yellow and black MR2 Mk3 Roadster this morning. I did give a wave as I turned off the main street towards Tesco. The weather was nice so I took a blast across to the West coast and back. It would have been even better if I'd had the presence of mind to take the hard-top off before I left. I saw a Mk4 the same colour as yours Ian, parked about half way between Poolewe and Ullapool and I thought "it can't be" and... it wasn't. I made a mental note of the number plate and checked the one in your profile pic when I got home. Totally different. It was a cracking day over there; surprisingly warm in the sun, contrasting with heavy frost that persisted all day in the shadows of the hills and in little hollows (more near Inverness than right over on the West to be fair). Road grime made the car filthy. I was able to take a walk around Inverewe gardens in a T-Shirt and sit for a bit facing the ocean soaking up a few very, very late summer sunrays. The car doesn't have an ambient temp gauge but the external temperature certainly dropped sharply when the sun went away. My wife did ask “what’s that?” as we waited behind you at the lights on Keithhall road Sounds like you had a cracking day out. We were on our way to meet some others for a round about trip to Fochabers and back, stunning day up on the Moray coast too. Thanks. I've always liked the MR2 as well (obviously). I had a Mk1 for a while and I've had 3 Mk3s. I know that the Mk2 is very popular but, for me, the 1 and the 3 are favourites. I actually had two yellow ones until very recently. The one above came with the various body kit bits already on it. Oddly, I still somehow associate you with the Mk1! Funnily enough, so do I. I was having a conversation about cars at work today and I heard myself saying "I've got a Mk1 MX5 at home". I wasn't accidentally calling the RF a Mk1, I genuinely had a mental image of my silver MX5 sitting in my garage. It hasn't been there for years now. I guess we should both sign up for a place in the auld folks home. Enjay wrote: Funnily enough, so do I. I was having a conversation about cars at work today and I heard myself saying "I've got a Mk1 MX5 at home". I wasn't accidentally calling the RF a Mk1, I genuinely had a mental image of my silver MX5 sitting in my garage. It hasn't been there for years now. You may choose to leave them, but they will never leave you.